Many people have a hard time remembering what they ate for lunch, what they did yesterday or last weekend, or where they put their eyeglasses and keys. 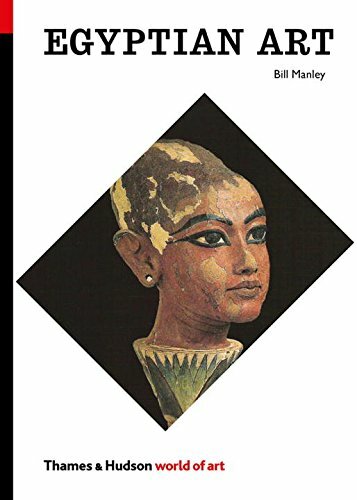 Which is why Egyptian Art by Bill Manley is so remarkable: he is pulling up 5,000-year-old memories, artifacts, and ancient ideas that are tricky to put into a 21st century context. Exotic Egyptian ideas, which are even harder to fathom, don’t even fit neatly into our calendar system for keeping track of years, months, or hourly to-do lists. But by understanding these antiquated systems and ideas, Manley explains, Egyptian concepts don’t seem quite so outdated and, in fact, reveal more commonalities with modern day than one might realize. From an art history perspective, all humans create. Our souls are expressed in the items we manufacture. This is the concept at the heart of Part I: Art & Creation of Manley’s project. Discussing architecture, painting, sculpture, jewelry, tiles, dishes, etc., in a range of mediums, Manley draws conclusions about the purposes these items served and the values they represented for the community. Manley organizes his thoughts into three categories. In pondering all the how, who, what, when, where, why’s, there fall out several principles of Egyptian art. The most important principle being that the majority of Egyptian art was pharaonic, meaning for the purposes of the god-king rulers (Pharaohs). Although this was the purpose of production, the craftsmen who delivered were critical to the endeavor, well respected, and the topic of Part II: Art & The Artists. Where Parts I and II set the stage for the basis of the Egyptian belief system and the expressing of these beliefs through the art and the artist, the eight chapters of the heady and bulky Part III: Art in Context identify ways these expressions changed over the centuries. A change in leadership, an influence from another culture, a rise in demand from the population—each contributed to shifts in art production. In the manner of a university lecture series, Manley is careful to review concepts as he marches along with each subsequent thought. Each chapter draws a bit deeper into the evidence he presents to demonstrate his principles. Yet, try as he might, the topic is difficult and choppy. One can easily imagine a classroom setting with a bunch of sleepy-eyed students fighting to absorb the presentation. As the reader goes ’round and ’round with centuries of intricacy, it becomes apparent that the art of ancient Egypt is little different than the art of early Christianity, the ancient Romans, the Byzantines or the Renaissance thinkers or, even, us. With Pharaohs commissioning works and grand-scale construction programs the way Popes would in more recent history. The promotional blurb touts this book as being an introduction and a quick survey to Egyptian art. However, Egyptian Art History 101 this is not. Referencing all of the 31 Dynasties, a 302-year Greek Period, and the entrance of Jesus Christ onto the scene within the Roman Empire (through Constantine in 311–337 CE) inside of 300 compact pages, it would be a struggle to digest this information without some prior exposure. Be sure to locate those eyeglasses before nestling down for the next chapter-lesson because the teeny tiny font will create an eye headache long before the thinking headache of Egyptian timeline facts takes over. The minutiae might be intimidating, but still it is worth the look for the very reason that one will dig up interesting insights. Remarkable commonalities will link them to a similar soul who walked this earth thousands of years ago, carrying an item similar to what is carried today, thinking thoughts that are similar to those of us still present.